Admittedly the first one was also bad, but nowhere near this level. This is ground-level nuclear strike bad. We're talking "Bad Film Connoisseur" bad. At times, it's a comedy. I was laughing aloud at the screen. Part 1 failed in a comparatively restrained way that feels fixable. The filmmakers got carried away with the action, the world and the Titans and hence forgot to pay any attention to the characters. Whoops. Similarly, one of Eren's fellow soldiers is really strong. Looking back, I think the film's idea of character establishment for this was the gut-bustingly stupid "human judo-throws a Titan" moment in Part 1, after which I don't think it was ever referred to again. I'm not too offended by the laughably bad Captain Levi substitute, because I find Levi dull in the original manga/anime. (This is a minority opinion.) However it distresses me that Satomi Ishihara is so unspeakable as my favourite character, Hange. In fairness to her, though, shouting under strong emotion is a consistent problem in these Attack on Titan films. Kanata Hongo fails with it as Armin, too. So the film's building up to some awesome-looking but empty action scenes. 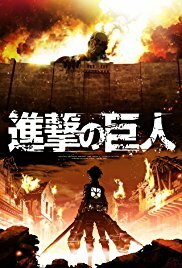 In contrast, the anime and manga are primarily an exploration of how trauma, obsession, loss and survival guilt, but set in an ultra-violent world of man-eating Titans. (b) an unrelated acting problem with the humans who can turn into Titans. As humans, they're not taking their scenes seriously. I can understand this. They're crocodiles in a world of earthworms. Of course they won't care what a bunch of humans think. However this affects the performance of the film's one good actor and makes someone else really irritating. He's a slimy camp self-satisfied poser, but the film thinks he's an awesome mega-hero because of the manga character they based him on. That said, the context justifies it. He's a villain. He's a Titan who can go about in human form. Yes, he might easily be like that (and he's capable of being less oily when the scene requires it). However it's still eye-rolling, especially in a certain bit at the end. (c) The fights and action scenes often have no weight. This isn't always true, so for instance it feels important when Eren's fainting and about to fall off the wall. However the scene of two Titans fighting each other is unintentionally funny, with electric guitars on the soundtrack and an air of "wow, it's Ultraman!" There's no intensity. It's not scary. You don't care who wins. You're too busy laughing. Later, the Colossal Titan's transformation gets some cheesy monster movie music that makes me wonder if the director was taking the piss. It's funny, but wow. I also defy anyone not to laugh at the overdone swelling Hollywood music at the end as the survivors gaze towards the horizon. Amusingly, I see that the director (Gainax co-founder Shinji Higuchi) and special effects maestro (gore comedy maestro Yoshihiro Nishimura) have been defensive about criticism of these two films. In fairness to Nishimura, I like the special effects. He did well. However this film stinks and the best self-defence strategy for its production team would be to run away. What did I like here? The first half-hour isn't bad. There's a big Jun Kunimura scene that works because it's Jun Kunimura, who's getting more to do this time. It's not his fault that the film's chosen to resolve it with a Titan-ex-machina, since it has no interest in human drama. After that, the surreal jukebox moment is cool because it's unexpected, after which Hiroki Hasegawa's great thudding lump of explanation manages to be quite interesting because it's telling us what's going on and how the world got this way. I like these ideas. You could tell a good story with them (e.g. the original manga). To be less flippant for a moment, though, one thing about this film is genuinely annoying. I hadn't minded the film being trash... but that was until I learned that Shinji Higuchi wasn't the original director. That was Tetsuya Nakashima, director of Kamikaze Girls, Confessions and Memories of Matsuko. Confessions was Japan's submission to the 2010 Oscars, you know. It's bloody good. Memories of Matsuko is an unbelievable film. He could have made something genuinely special out of this material, but he quit in December 2012 over creative differences with the rest of the production team. I understand. I have some creative differences too. I think they made a load of garbage. I'm going to go out on a limb and guess that I'd have probably preferred Nakashima's version. However I'd better change the subject, because that "what if" is just painful to think about and it's better to be in a good mood when talking about this shallow blob of nonsense. This is a hilarious film, but only if you like bad movies. Don't expect it to resemble the manga. I can't even get angry about the fact that the film's so short, because its length is perfectly suited to its approach and you couldn't fix that just by cutting out less from the original. Obviously they've shredded the original story, but that's so comprehensive that it would have only added to the insult had they got slightly closer to Hajime Isayama's original work. There's no similarity between them. The few glimpses that remain of the original are among the most jarring bits of this film, because they're so badly integrated in a film that blatantly doesn't give a damn what the manga's doing. You might as well expect a Tom and Jerry cartoon to go borrowing from John Steinbeck's Of Mice and Men. I can almost respect that. If you're going to do something, go all the way. Do it hard and do it without looking back. In principle, I approve. In practice, though, it's taken one of the decade's most internationally successful manga and turned it into an uproariously bad, dumb monster flick.